I've been running around too much lately but that's what happens when I have too many projects going on at once. On Wednesday, after work, I stopped by the pound to pick up the schnauzer that I had taken to get groomed the weekend before. I should have never taken her back to the pound because she got kennel cough and slept through the entire adoption event on Saturday. People don't want to adopt a dog that looks dead. She will stay at my house for the next 2 weeks and, hopefully, she will be feeling perkier at the next adoption event. On Thursday, I visited my dad after work and kept him company through dinner. He was in a good mood and quite talkative although I can't understand what he says most of the time. On Friday, it was nice to be able to go directly home after work. Saturday I was up bright and early because the dogs were up. I was pretty sure I would be able to get a nap later so I started on my chores. The mountain of laundry took all weekend to conquer but I got a good start on it and then dropped the schnauzer off at the adoption event. I love that I don't have to stay there for 5 hours. One of my favorite stores, Ross, was nearby so I stopped in to look for comfortable shoes. I found one pair of brown leather shoes for $25. After trying on many unsatisfactory walking shoes in the women's section, I remembered to check the men's section since I have a wide foot anyway. There I found some nice walking shoes with memory foam. No longer do I have to wear the uncomfortable Nike's that make my feet fall asleep. They were only $35 and I am actually looking forward to Monday a little bit just because I get to wear them. I also grabbed some new sheets, socks, and a very soft blanket that I didn't need but it was only $8 and I have a weakness for soft blankets. After the shopping spree, I went back home for lunch, more laundry, and a quick nap before I jumped back in the car, picked up my sad, lethargic dog who didn't get adopted, and headed to the airport to pick up my mother. I was 5 minutes late and I didn't even get to fill up her car with gas because the pay-at-the-pump machine wasn't working and the line inside was too long. We stopped at another gas station on the way home and got a car wash too so it all worked out. On Sunday, I actually had a little extra time to work on my garden projects. I cut down my gourds and started taking down the vines. In the side yard, I had the bright idea to use these old dog houses as grow beds. I am attempting the "air pruning" technique in the first bed. 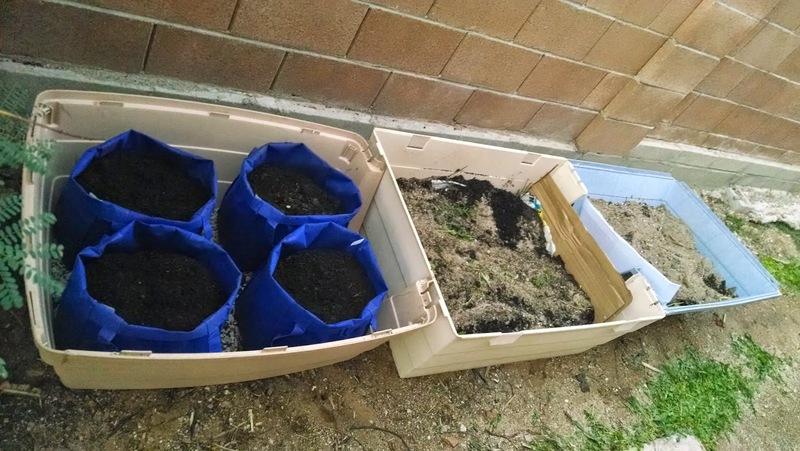 I filled reusable grocery bags with soil. They sit on gravel and I am supposed add water to the gravel and the bags will soak it up. That's the idea anyway. I need some of those mosquito larva killing granules before I start although in a week or so it will be too cold for mosquitoes anyway. I didn't plant anything yet because I ran out of soil but I have around 10 different kinds of seeds to plant that I got free from the local seed library. I was going to throw out the dog houses because one was only a top and the one with the bottom was broken but then I realized that they would make great planting boxes. Time will tell if my experiment will work. Daizy, I get worn out just reading about your list of chores LOL! You know, Dave, I should know that I have too many hobbies when I get excited about not having any plans on the weekend. There's just so much to do. Well, Lizzie, I can't keep house plants alive. I think house plants are a different species altogether.